(Central Islip, N.Y., July 1, 2015) – The three-time Atlantic League champion Long Island Ducks today announced the signing of left-handed pitcher J.C. Romero. The 14-year Major League veteran begins his first season with the Ducks and in the Atlantic League. Romero played with seven different organizations in the Major Leagues, including seven seasons with the Minnesota Twins and five with the Philadelphia Phillies. The southpaw combined to appear in 680 games (22 starts) and compiled a 34-28 record with a 4.16 ERA, seven saves and 526 strikeouts in 661 and one-third innings. 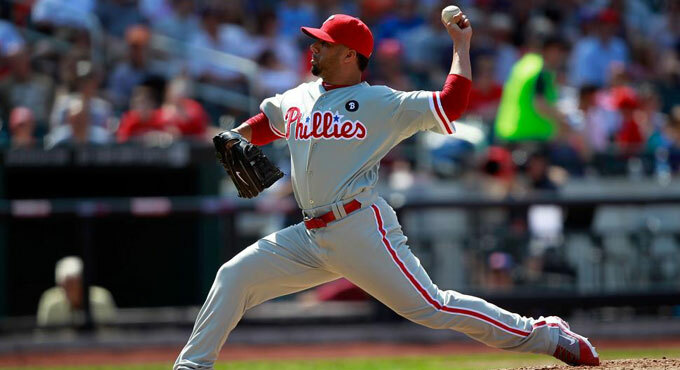 He was a member of the Phillies’ 2008 World Series championship team and earned two wins during the series, including the title clinching victory in Game Five over the Tampa Bay Rays. The Puerto Rico native had a career postseason record of 2-2 with a 3.15 ERA in 25 games and struck out 15 batters in 20 innings. He helped the Twins to an American League Championship Series appearance in 2002 and the Phillies to the National League Championship Series in 2008 and 2010. The 39-year-old began the 2015 season with Puebla in the Mexican League and earned two saves in five games, allowing two runs in six innings while striking out five. He has a career minor league record of 27-19 with a 3.12 ERA, 22 saves and 376 strikeouts in 240 games (33 starts). Romero was originally drafted by the Twins in the 21st round of the 1997 amateur draft.